Benedetta Tagliabue was born in Milan and graduated from the University of Venice in 1989. In 1991 she joined Enric Miralles’ studio where she eventually became a partner. Her work with Miralles, whom she married, includes a number of high profile buildings and projects in Barcelona: Parque Diagonal Mar (1997-2002), Head Office Gas Natural (1999-2006) and the Market and quarter Santa Caterina (1996-2005), as well as projects across Europe, including the School of Music in Hamburg (1997-2000) and the City Hall in Utrecht (1996-2000). In 1998, the partnership won the competition to design the new Scottish Parliament building and despite Miralles’ premature death in 2000, Tagliabue took leadership of the team as joint Project Director and the Parliament was successfully completed in 2004, winning several awards. She won the competition for the new design of Hafencity Harbor in Hamburg , Germany, for a subway train station in Naples and for the Spanish Pavilion for Expo Shanghai 2010 among others. Under the direction of Benedetta Tagliabue the Miralles-Tagliabue-EMBT studio works with architectural projects, open spaces, urbanism, rehabilitation and exhibitions, trying to conserve the spirit of the Spanish and Italian artisan architectural studio tradition which espouses collaboration rather than specialization. Their architectural philosophy is dedicating special attention to context. 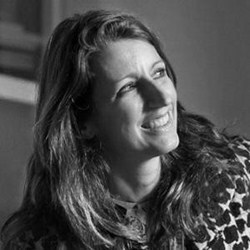 Benedetta has written for several architectural magazines and has taught at, amongst other places, the University of architecture ETSAB in Barcelona. She has lectured in many international architectural Forums as, for example, the RIBA, the Architectural Association and Bartlett School in, London, the Berlage Institut in Amsterdam, and in USA, China and South America.